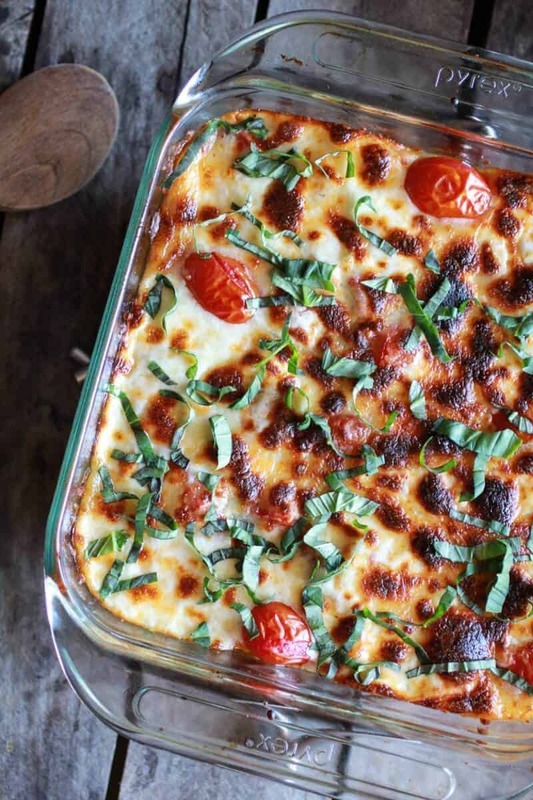 You need this Creamy Caprese Quinoa Bake today. It’s got tons and tons of basil. My very favorite summer herb. As if you did not notice. It’s also loaded with tons and tons of sweet grape tomatoes. Another summer favorite of mine. In fact, they are my favorite variety of tomatoes. Okay, well actually I think I like heirloom tomatoes the most…. But of course, I can never, ever find them and when I do? I totally can not afford them. So I pretty much always go for the cute little grape tomatoes. So I am on a bit of a quinoa kick. I think most of the world is. It’s quick, it’s good, it’s hearty and it’s healthy. But I went and made it so much better today. I combined it with fresh tomatoes, basil, a little cream and a lot of cheese. Then I melted that cheese in the oven. Yes, the oven. Trust me this is worth turning the oven on for, plus it is only a short cooking time. 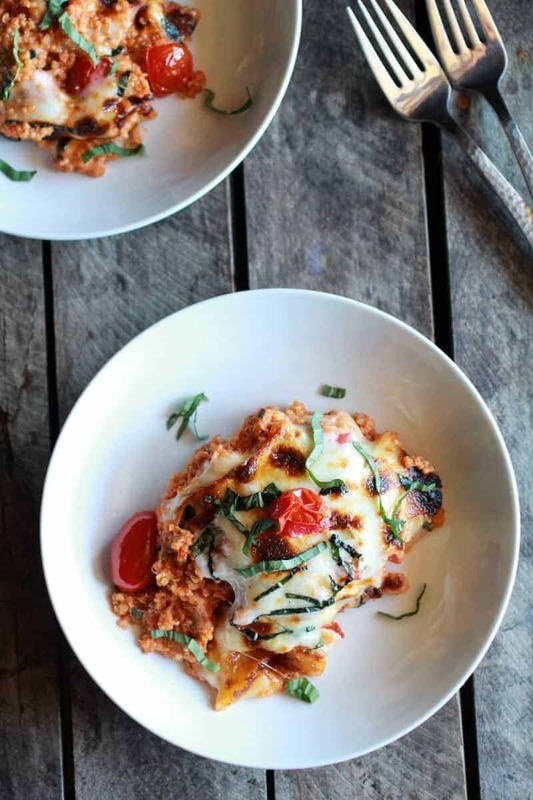 Just a few minutes under the broiler and you have ooey gooey cheesy quinoa. Like a melty caprese pasta, but with quinoa. It’s a pretty good twist. Plus simple, easy and so quick. Just what every Monday needs. Oh, and apparently I feel Monday needs lots of photos too. Photos are easier on the brain anyway. It’s a good way to ease into the week. Like a melty caprese pasta, but with quinoa. It's a pretty good twist. Heat tomato sauce and tomato paste over low heat in a large saucepan. Once warm, stir in heavy cream, parmesan, crushed red pepper, salt and pepper. Remove from the heat and stir in the quinoa. Fold in half of the mozzarella and half of the tomatoes, then chop 6 fresh basil leaves and add them in too. Once combined, spray an 8x8 or 9x9 baking dish with non-stick spray and pour the entire quinoa mixture into the dish. 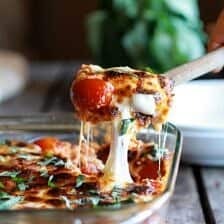 Top with fresh mozzarella rounds or shredded mozzarella and the remaining tomatoes. Remove from the oven and top with fresh basil ribbons. Allow to sit five minutes and then serve. 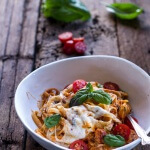 This was inspired by [How Sweet It Is | http://www.howsweeteats.com/2011/05/creamy-caprese-pasta/]. 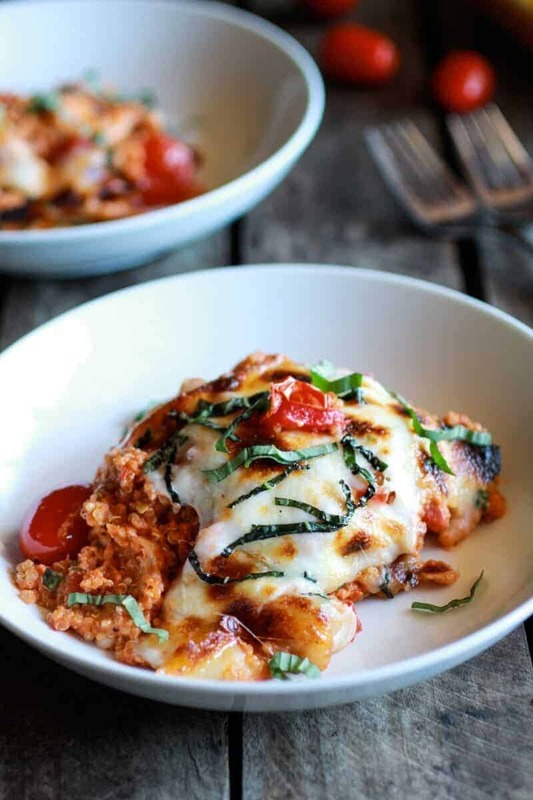 Oh, and so is cheese, lots and lots of cheese – Creamy Caprese Quinoa Bake! You’re so, so right… I totally need this TO-DAY! Sounds great! How many servings does this make? I want to make this for a potluck dinner. this serves about 4-6. 4 as a main, 6 as a side! It’s like mac n cheese – only with quinoa replacing the mac – this “quin cheese” looks so good for EVERYDAY consumption! Tieghan, that looks downright delicious. I can’t wait to try it! The photos are wonderful! Basil, how do I love thee? On, in, and around EVERYTHING! This looks like cheesy summer heaven. Yes please! Thanks Erin! I am a basilaholic these days! I’m oh so totally making this. Yum! This combines two of my favourite foods, quinoa and caprese salad! I agree I do need this. Thank you so much, Abbie!! I am finding myself using quinoa more and more. And with all that cheese! Well, cheese is good. Very good! Cheese is very, very, very good! LOL! Awe, thank you so much!! I am so happy you like my site!! I use a 50 mm macro cannon lens and love it! Love this recipe. Is there anything I could replace the cream with? You could try using milk, but I am sure it would be as creamy. Still delicious though! Although, coconut milk would be SO good! !I think I need to remake this with coconut milk. YUM! This looks like one savory and absolutely delicious dinner recipe my whole family will enjoy. Is it dinner time yet?! I can’t wait to make this! Thanks for a fantastic recipe. Thank you so much, Laura! I hope you and your family love this! I DO need this!!! Looks wonderful and your pictures are great!!! Yes, yes, and yes! I’ve never made a quinoa bake/casserole type dish and this is making my mouth do some serious watering/happy dance! I love how the quinoa makes this total health food. And all that ooey gooey cheese is the BEST added bonus! Yes, I love that too!! Thanks Joanne! Really looks yummy. I’m closer to being a vegetarian than my wife, but to “sell” this to her as a one pot meal I may add some shredded chicken to it. I’ll let you know how it turns out! Chicken would be a great addition! Hope you guys love this! Thank you so much, Hannah!! I am so glad you like my photos and recipes!!! 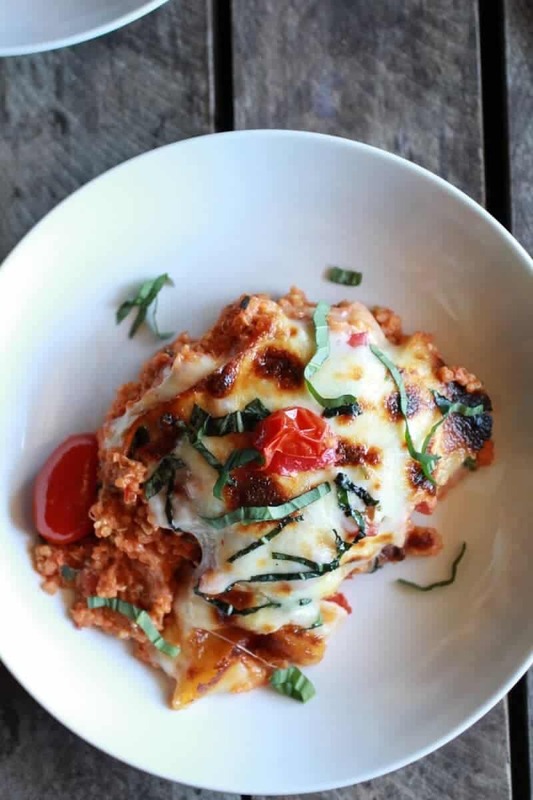 I’m loving the non-traditional use of quinoa – I have some picky customers but what doesn’t taste good with basil, cheese and tomato. I also love your style of writing. Pure comfort food, I love it! This sounds heavenly!!! Could I use reduced-fat or fat free milk instead of the heavy cream to cut some calories? Hmm. I am not sure. I would think it would not turn out as creamy, but still be really good. I would say it is worth a try, but just do not expect it to be super creamy. Majorly drooling over here. This looks SO good. All that cheese is making me drool. I love this recipe. My husband was just saying how he’s anti quinoa and wants me to make it so he’ll like it. YUM! This is perfect then. It’s got load of cheese, which everybody loves! Wow, this looks incredibly good! Great way to try to get my kids to eat quinoa. WOW!! I am doing a quinoa series on my blog this week, where quinoa will be the main ingredient in all of the dishes I am preparing. I might have to add this one to the list!! Aaaaanndd THUD! That was my jaw hitting the floor after looking at these pics. You’re killing me with all this deliciousness! Oh my gosh, you are right. I really DO need this today. Thank you for sharing this recipe, I have a bag of quinoa I have no clue what to do with, and this looks amazing! Ya! This sound perfect for then! Thank you! Oh my heaven. Yes! I do need this today. Looks mouthwateringly delicious. You’re very talented. Keep up the amazing work! I don’t think I can handle how good this looks! 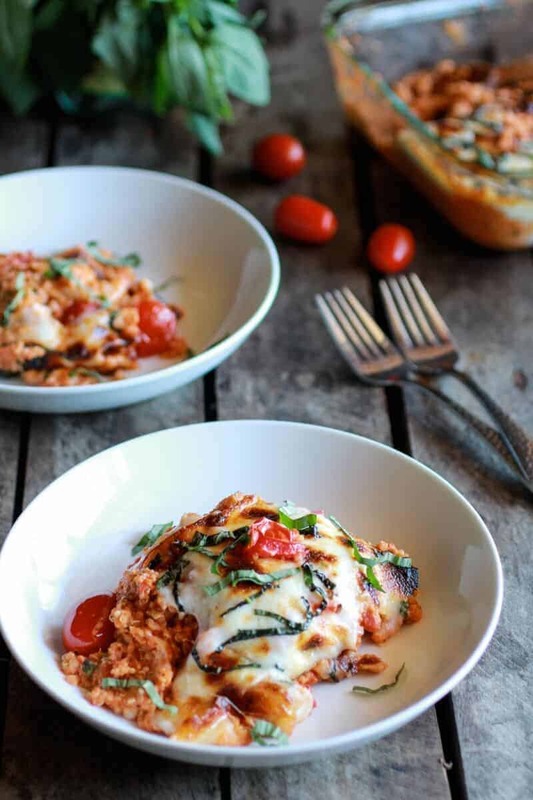 Caprese and quinoa are two of my favorite things right now, so this sounds like perfection! Thank you, Elise!! So excited you are giving this a try!! Hope you love it! I am loving this! Quinoa is one of my favorite grains because it is so versatile. You are definitely showing that quality here. I would’ve never thought to put that combo together. Brilliant! Thank you so much, Chelsea! I love quinoa too! i just made this and it’s SO so good! thanks for the great idea! i made a few adjustments- instead of cream, i used greek yogurt. and i added in rainbow chard and zuc to the sauce, to up the veggie anti. amazing. YUM!!! That sounds so good and I love the addition of greek yogurt! Thanks for giving this a try. I am so glad you loved it! Do you think adding cut of pieces of meatballs would work or take away from this dish? Hmm? I think it just depends on wether or not you guys are big meat people. My family would prefer this without, but some people I am sure would LOVE it with a spicy meatball. I think they would be a great addition if you are looking for something a little more hearty! Thanks Jen and I hope you love this! Hi! Planning on making this tonight and super psyched about it. Question: you say in the recipes “grape tomatoes- halved,” but do you mean “tomatoes- sliced in half” or “tomatoes- divided?” I ask because in the photos it looks like the tomatoes are intact (and bursting with goodness- though that can occasionally lead to biting into the occasional mouth-scorchingly-hot juicy tomato!) and it would be a bummer if I sliced the tomatoes and the dish turned out watery. Thanks in advance for the clarification and for this lovely post! Hi Lindsay, I cut my grape tomatoes in half and then sprinkled on a few whole ones right on top just because I like a few to get a little crispy. I recommend halving most of the grape tomatoes and if you would like just sprinkling on a few whole ones right on top. I have a question! When you say 2 cups of cooked quinoa, do you mean 2 cups of quinoa that are then cooked, or two cups of already-cooked quinoa? And if already cooked, what does that translate to in dry amounts? I have never cooked with quinoa before! I mean 2 cups of quinoa that have been cooked, which is 1 cup of dry quinoa. Here is a great How to on cooking quinoa. It is so easy, promise! Hi Kate! I think the overcooked quinoa will still be fine. It might be a little mushy, but all the flavors will be the same! Thanks and happy New Years! I have a question! When you say 2 cups of cooked quinoa, do you mean 2 cups of quinoa that are then cooked, or two cups of already-cooked quinoa? And if already cooked, what does that translate to in dry quinoa? I have never cooked with quinoa before! Wow! This may be the recipe that converts the hubby to a quinoa fan! It looks amazing! Oh my, complete perfection! A great way to use my garden tomatoes too! Lucky you! Wish I had some fresh garden tomatoes! Hi there, this dish looks amazing and I can not wait to try it! Do you have the nutritional information available? Thanks! Hi Megan! Thank you so much, but unfortunately I do not have the nutritional info. I know there are online sites that you can use to calculate this dish. Wish I more help! Do I need to use fresh mozarella? or can I used the shredded kind? Hi Melanie, I think fresh mozzarella is best, but shredded does the trick too! Hope you love this! 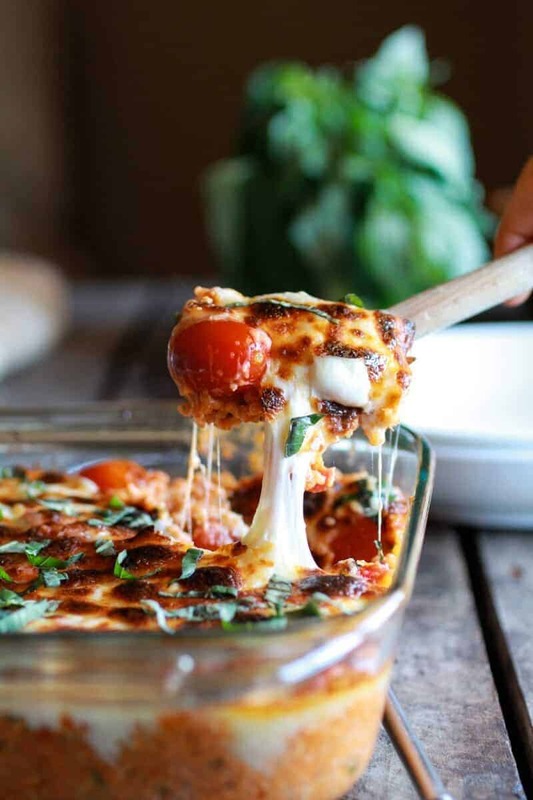 That picture…with the stringy, melty, gooey mozzarella deliciousness OH. MY. GOD. I can’t even handle it. Thank you so much, Des! I love that photo! Hi! I’m a new reader and I’m making this beautiful recipe for my visiting family tomorrow! Is this a casserole that can be made in advance, or should it be cooked the day on which you’ll eat it? Thank you! Hi courtney! This can be made in advance just bake a little longer than directed to make sure everything is warm throughout. Hope you love this and let me know if you have any more questions! Oh my goodness, this looks AMAZING!!!! I’ve never baked quinoa before, I need to try this!!!! Thanks for sharing, it’s on my “to try” list soon!!! Looks so delicious!!! Thanks so much, Maria! Let me know what you think if you try it! Is there anything quinoa can’t do?!? This sounds great. I know! Quinoa is a magical seed! Thanks Valerie! Ok Tieghan, I found your blog by following this pin on Pinterest. So glad I stumbled upon your delicious looking recipes! I made this tonight for dinner, and it was a huge hit (even with my friend who had somehow never heard of quinoa before!). I’ll definitely be making this again. Probably at least a few times a month. For the rest of my life haha. It was SO GOOD. I didn’t miss the pasta AT ALL. Thank you for sharing this easy and inspiring recipe! You’re super talented at food blogging, and I’m excited to try more of your recipes! Oh wow! Thank you so much, Megan!! Your comment was so nice and I am SO happy you loved this dish. Thank you so much for reading and I hope you continue love my recipes! Thanks for the great recipe! Just made it for dinner with a big green salad. Completely delicious. Found you via Pinterest and can’t wait to try some of your other recipes! Oh yeah!! Thank so much for trying this! So glad you loved it! Ok, this dish looks amazing! 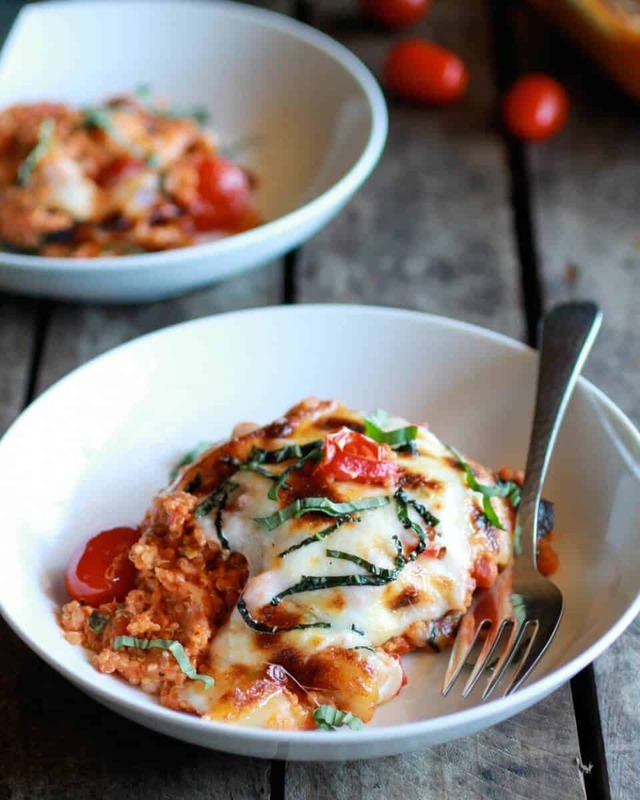 And I, also, have tons of basil that needs to be used up – def making this soon! Pinned! This was awesome! Had it last night. The store was out of quinoa, so I had to sub whole wheat pasta “made with quinoa.” Still great! 🙂 Can’t wait to make it again. Thanks for the awesome recipe! Thank you! So glad you loved this! Made it again tonight–this time with quinoa. EVEN BETTER. HEAVEN!! YES!! So happy you loved it…again! LOL! Glad to hear the grape tomatoes are healthier! This recipe is amazing. I have made it twice in a weeks time. However, I made it by adding sweet italian turkey sausage because my daughter and her boyfriend are all about meat being in their food. It would be just as wonderful without it though. They both had 3 helpinigs each. My parents loved it – my father said it’s definitely a keeper. Oh yeah!! So happy you guys are loving this!! The sausage sounds so good in this! Thats my goal!! LOL! Thank you so much, Heather! Glad I found this via Pinterest. I have a big bag of quinoa and fresh basil growing in my herb garden. I will be trying this recipe for sure. Eating starts with the eyes and your photographs are so yummy looking. Awe, thank you so much!! Your comment was so nice, Gail! Hope you love these! I made this last night and loved it! Even the kids liked it. I still have ingredients left over so I made it again. Have you ever frozen this? do you think it would work? I have never frozen this, but I do think it would work. Although, I am not sure how the fresh tomatoes would hold up. I would think they might get a little soggy after being frozen? Not sure. Let me know if you do freeze it and how it turns out. Thanks so much, Julie! So glad everyone loved this! This sounds delicious. I’m going to make it tonight as a stuffed zuccini boat – I think it will work wonderfully. I’ll have to precook the zuccini boats a bit first in the oven, then stuff. Oh that sounds amazing!! let me know what you think!! Definitely delicious in a zucchini boat. I added the zucchini to the quinoa mixture. Oh yeah!! So happy they work and you like the quinoa!! 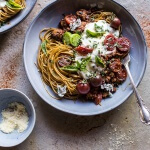 Hi, good morning, I just found your blog through a link from ” Simple Bites”, and ” 31amazing Things to cook in August. Awesome way to combine Quinoa in a meal. I usually eat it plain cooked in Vegetable broth, love it’s nutty taste. At our house, There’s plenty of fresh tomatoes on the kitchen counter and one basil plant , going to cook this up this morning for later. The suggestion of using Zucchini,and also the Greek yogurt instead of cream are good ideas. Your photos look so good, If only I could reach and get a forkful of your dish, L O L.
So wonderful that you found a passion in cooking and creating healthful meals for your siblings and family and sharing w/ the world. Thank you so much, Grace!! Your comment was so sweet and the zucchini is a great Idea. I love that addition! Thanks so much for reading and leaving such a nice comment! Found this on Pinterest and can’t wait to make it tonight. One comment…I think you meant to say the recipe came from “How SWEET…” not “How SWEAT…” haha 🙂 Thanks for the great recipe!! Oh geez!! Thanks so much for letting me know! I fixed that! I am so making this tonight!!!! Yumm-o!!! Thank you!! Hope you love this! So I made this and I think I’m in love!!!! Wow just wow, this dish ROCKS!!! For sure a keeper! So happy you loved this!! Thanks Claudia! Awe! Thanks Nala! Hope you give this a try! I’m making this for dinner tonight and I’m looking so forward to it. Your pictures are amazing! Thank you for sharing this! Oh yeah! Hope you love this and thank you so much! This will be a summer favorite when tomatoes and fresh basil are growing in the garden. Made this tonight, threw in a couple of grilled diced chicken breasts to make it a meal. Beautiful dish! My family LOVED it! Oh yes!! So happy you guys loved this! This recipe looks amazing! I am dying to make it. My only question is, what can I substitute for heavy cream? Would greek yogurt work? I still wan the creaminess of this but not the heavy cream. Hi Jenn! Yes, I think greek yogurt would work great or even lite coconut milk too! Thank you so much and let me know what you think. Hope you love it! So happy you like this!! Thanks for making it and I love your additions and swaps! I tried this recipe today and was absolutely blown away! It was so delicious I wanted to eat it all. My boyfriend was impressed just looking at it, he thought it looked restaurant quality. Thanks for the amazing recipe!! YES!! Of course, Sarah! I am so happy you guys love this! Hello! I have been drooling over this recipe for months now. And I finally have all the ingredients laying around! They are all leftover from a delicious pasta salad that I just made. The problem is that it’s a HUGE pasta salad and there is no way I could possibly eat that and this quinoa bake. Anyone have any experience freezing quinoa? I imagine baking it and then flash freezing so I could portion it out. Hi Lauren! I have never frozen quinoa, but if I had to guess I would think it work great! Let me know how it goes! Thanks for getting back to me! I’m going to be adventurous and try to bake it and freeze it today. Will report back. I wasn’t able to make the recipe til today, so there was no need to try and freeze. The dish came out very good. I just used a lot of what I had on hand. Red quinoa (interesting), 1/2 of a small container of plain greek yogurt, and extra sauce since I’m not a fan of cooked cherry tomatoes (and also because I ate the whole pint as a snack while doing the rest of the prep! oops. ), and I followed the rest of the recipe as written. The greek yogurt added a nice creaminess, and the red quinoa has a slightly different flavor, but other than that, the recipe itself is great! thanks for posting! So happy you liked it, Lauren!! You are so welcome!! So happy you loved it! You are so welcome!! I am so happy you are enjoying it so much!! Made this yesterday. IT WAS DELICIOUS!!!! Yes!! So happy you love this! Thanks Monica! I’ve trying to figure out a way to make my quinoa taste good since it’s such a good source a protein, and this was delicious! I will definitely make this again and again. Oh yes!! So excited you loved this! That makes me so happy! Thanks Emilie! So happy you loved this! Hey- I found your Quinoa Caprese recipe on Pinterest just when I was looking into more quinoa recipes. My husband is Gluten Intolerant, so we are always looking for good savory foods he can eat. I will tell you- we both loved this recipe!!! Thanks so much for sharing it- You are truly talented and you made a follower out of me (and my husband). Thanks again- we are making it a second time tonight it was that good. We will try adding meatballs for a variety tonight. Oh you are so welcome!! I am so happy you guys loved this and so happy you like quinoa because i have a few new recipes coming up soonish using quinoa! Omg! Just made this and it’s absolutely delicious! I used half and half instead of heavy cream and only shredded mozzarella. Came out delicious. Fresh tomatoes and basil are a must. Thanks for sharing this recipe. I will make it again and again. So happy you loved this!! Thanks so very much, Sonia! I made this tonight for myself and a friend. We practically licked the pan clean. (I actually did lick the serving spoon clean.) So delicious! Thank you so much for sharing the recipe. I’m definitely adding it to my meal rotation. Yay! You are so welcome! Thanks Marry! I am making this tonight for a meal swap! I can’t wait to try it. I have recently gotten into quinoa myself and am just impressed at how healthy it is and delighted at all of the possibilities! I am going to try doubling this so that I can have lots to share and lots for myself! Do you think I could put it in a round baking dish? Alas, I have no square! Hi Jessica! I am sure you have already mad this, but yup a round dish will work fine. Hope you loved every bite of this! I did go ahead and make it. It seemed to do great in the round dish, and I put some in a few small corningware dishes for myself! I am so glad I have so many leftovers, and my friends already tried it and said they love it! With the mozzarella rounds, roasted tomatoes, and basil ribbons on top, it looks like I worked for hours! Love it! Hi Sapna! I always rinse my quinoa first, here is an awesome how to and how exactly to cook quinoa!! Opps!! Here is the link. Maybe a little drizzle of your balsamic glaze across each plate before serving? 🙂 –Sounds yummy. Thanks for posting this! That sounds awesome! Thanks Andrea! I made this last week and it was absolutely fantastic! I am in the process of making it again now! I add chopped sweet potato and spinach and it is so yummy. Glad I found it! YUM! I love the additions! Thanks so much, Nicole! So happy you love this! I knew I had to have this as soon as I saw it! I made it for dinner tonight and we loved it! Can’t wait to try more of your recipes! Thanks so much! Thank you so much, Rebecca!! SO happy you loved this and so excited you are going to try some more recipes! Hope you love everything you try! This is officially the first meal I baked in my new college apartment, and it was fantastic! I’ll definitely make it again, and maybe add in some more veggies (zucchini, maybe?) Thanks for the great recipe! YES!! So exciting and I am so happy you loves this! Zucchini would be awesome! I just made this. YUM!! Thanks for sharing. So happy you loved this! Thanks Gaby! I just made this dish and thought it was incredibly delish! My anti-vegetarian clan also enjoyed it! I was wondering if you had the nutrition components already figured out assuming the 4 serving suggestion you posted. Hey Lacey!! So happy you love this!! I do not have the nutrition info, but I know you can calculate it online. Sorry I was not of more help and thank you so much for making this! This. Looks. Amazing. 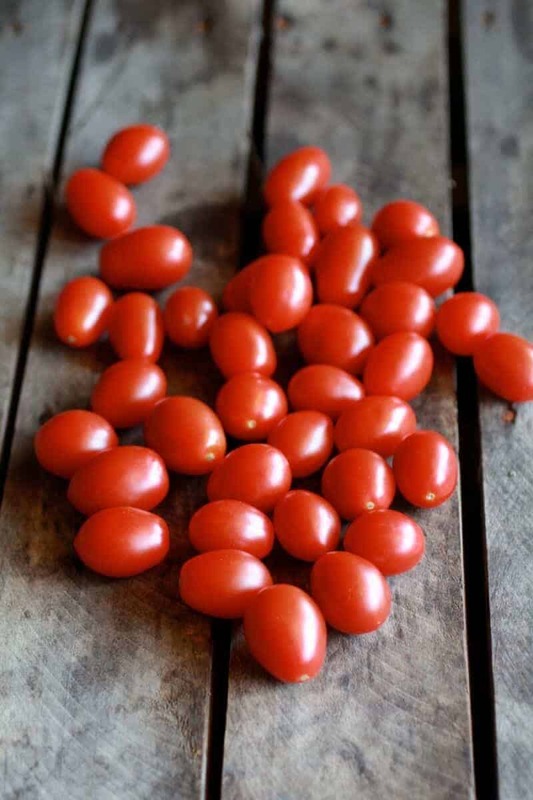 Question: I’m in Africa and I’m pretty sure I’ve never seen grape tomatoes, could I use roma instead or would it totally ruin it? Also, used to have fresh basil but it’s dry season now and everything is pretty much dead. What would be the substitution amount for dried basil? Hey amanda! Romas should be fine and I would use 2 teaspoons dried basil. Hope you love this and thank you!! I love this this recipe soooooo much!!! Includes all of my favourite things!!!! Have made it so many times and it’s such a hit! I add red capsicum and left over roast chicken as well, soooo good! Thanks so much! I am so happy you love this dish! i made this today and it was AWESOME! thank you for posting! Thanks! I am SO happy you loved this! First of all, this recipe is fantastic! My family loved it so much, this is the second time I’ve made it in the last three days! Secondly, is there something wrong with your website? When I was using the recipe from my phone (both on the Pinterest app and Safari), I was redirected every 10-20 seconds to the app store, to games like “Hay Day” and “Game of War.” It got so irritating, I had to take screenshots of the directions and use them from my photos… It’s not that big of a deal, but it WAS quite annoying. Oh am so sorry, Haley!! I have actually been looking into this problem and hopefully it will be fixed soon. I have someone re-designing the site right now and they should be working on it, but I am SO sorry you had a bad experience. That is not what I want people to get when they visit the sight. Thanks for letting me know and for making this. I am very happy you liked the dish! I omitted the salt, added extra red pepper flake, and used Rao’s marinara (the best ever). I made this twice last week. EVERYONE loved it. Next time, I will try with half&half to cut the dairy fat a little. Love your additions!! So happy you are enjoying this dish!! I wish this recipe had dictated that the quinoa needed to be pre-cooked – I stirred in two cups of dry quinoa and ended up with a dish with crunchy uncooked quinoa! Can you think of anything I can do to save the dish so I don’t have to toss it all? HAH! It’s no big deal. I just sent you what I would do. Hope that helps you! Oh and I do not mean Hah in a mean way! Trust me, I miss read recipes all the time! The recipe actually does say cooked quinoa, but here is what I would do to try and save this. If you can, remove the cheese from the top and add the quinoa to 3-4 cups boiling water. Reduce the heat to low and simmer for 15-20 minutes or until all the water has been absorbed. Transfer the mixture back to the dish and add the cheese. Bake as directed. Delicious!! This dish is always a hit. I’ve made it a couple of times already – with a few variations (sub’d cream with half and half, used garlic, and added a layer of ground beef then topped with cheese for a faux-quinoa cheesy lasagna – oh, and liberally spiced with crushed chipotle pepper flakes). Love your blog and styling – thank you!! Awe!! Thanks Andrea! I am so happy you are loving this dish! Your variations sound so good! I don’t cook at all, like NOTHING! And I asked my mom to to help me make this and it was everything that we already had in our fridge so it was amazingly easy! 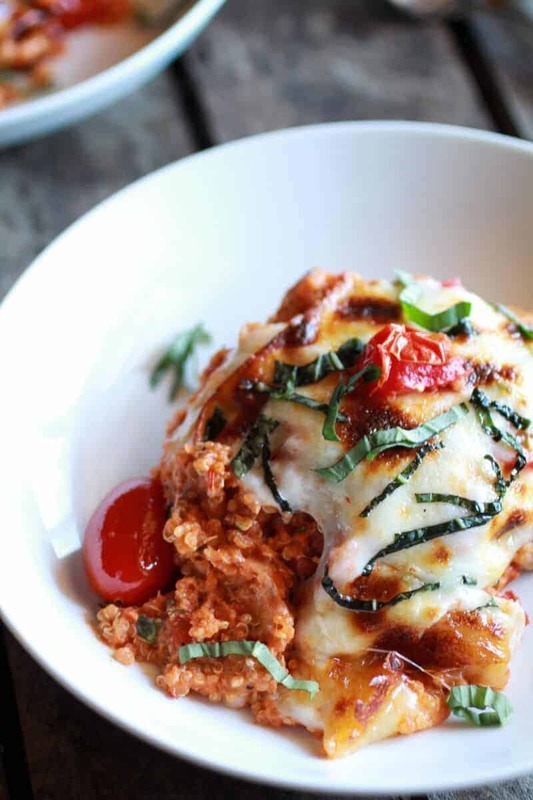 It’s so cheesy and delicious and the sauce has a little kick to it which isn’t overpowering. We had extra sauce to it and it’s delicious with pasta! make it, just do it! YAY!! So happy you loved this and had success making it!! This is always a got to meal for me! Fantastic recipe! 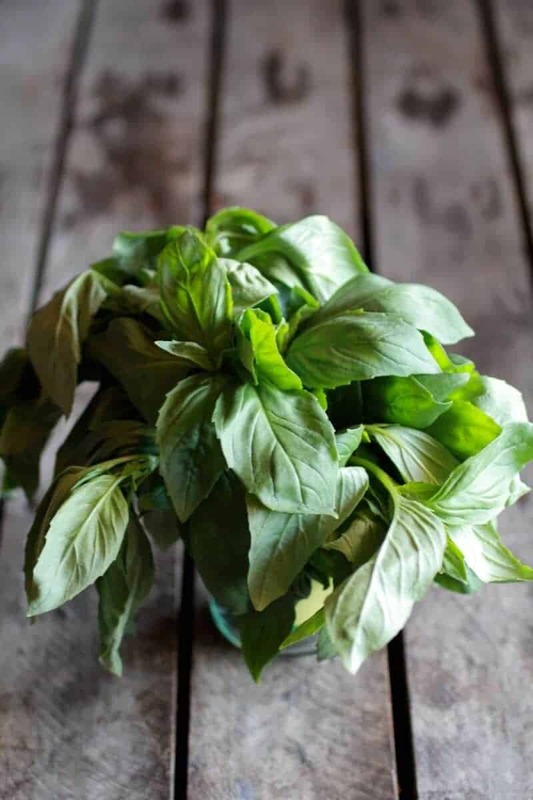 Not sure if I will be able to find any fresh basil at this time, but I am definitely pinning it on my dishes I want to try board! Thank you so much, Vicky! Hope you love this! So happy you loved this! Thanks for making it! oh, for me, 15 minutes it was not nearly ready; I baked it for a total of 25 minutes and then broiled for 2. …and then we DEVOURED IT! SO happy you guys loved this!! Oh and I have a grape tomato obsession too! We tried this tonight and it was great! I didn’t use the tomato paste since I used more tomatoes. I probably could have added more mozzarella. I used more than the 0.5 cups recommended on the top (maybe 0.75-1 cup shredded? )–the more cheese the better! Our pyrex dish is not supposed to be used under the broiler…so I didn’t brown the cheese. Both of us went back for seconds and now there is only a little left. I’m sure with real fresh mozzarella it’s even better. Made this earlier today for lunch and I love it! This was my first time cooking & eating quinoa and I can understand why there are so many recipes with it. I’m not great with a knife so this was a super quick & beginner-friendly recipe. Accidentally left out the garlic and I loove garlic, but it was still very delicious without. Thank you! Thank you so much, Angie! So glad you love this! I have some more quinoa combing VERY soon! I love quinoa, my husband hates it. 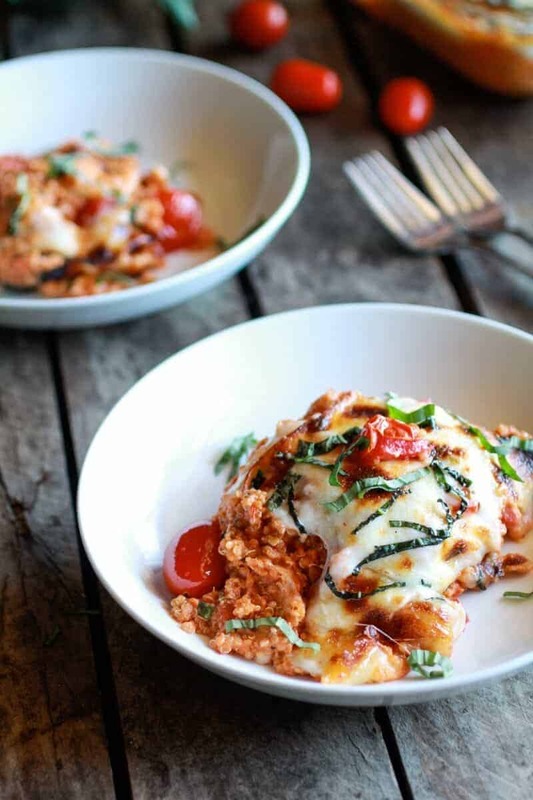 I saw this recipe with the caprese flavors he loves and served it with my fingers crossed — he loved it so much that he had seconds and took the leftovers for lunch today! He is actually open to other dishes w/ quinoa in it now – woo hoo! So happy you guys loved this!! Thank you! 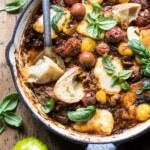 Do you think if I left the quinoa uncooked (like in this recipe http://www.eatgood4life.com/tex-mex-quinoa-casserole/) and baked longer (without cheese on top), that would work? Regardless…this shall be made this weekend. Thank you!!! Yup, think it would work, but add 1 cup or so of water so the quinoa can cook properly. Enjoy! Thank you! Hope to report back soon! This was so easy and delicious! I made the quinoa the night before so there would be less to prep at dinner time. Next time I will probably make the whole thing the night before and just pop it in the oven when I get home from work. My husband and I restrained ourselves from eating the whole thing so there would be leftovers for lunch the next day. So happy you loved this!! Thanks! This is one of my favorite dishes. I would like to double the recipe and freeze half for a a quick meal. Do you think it will freeze well? I have frozen it and it works great!! Thanks! Did you bake it first and then freeze? You could do either, but I think freezing first and then baking is a little better. Let me know if you have anymore questions. Thanks! My husband and I love this recipe! It’s worth heating up the house for a short time. Do you think I could double it and bake it in a 9×13 for a larger crowd? Thanks! Wow, this dish looks amazing! I added zucchini, both in the mixture and on top. Delicious! This looks heavenly! I love quinoa! I’ll definitely be trying this! I’m not sure whether you and other food bloggers are aware of this, so I thought I’d let you know that it is really irritating to have to scroll so far down to get to the recipe simply because there are so many photos of the exact same thing from different angles. These photos do not seem to serve a purpose other than to take up space. One photo of any particular thing is sufficient. This also applies to food bloggers who post photos of things that are patently obvious, like cracking an egg and boiling water. I understand that there is pride involved in taking nice photos, but for the readers (whom I assume bloggers want to keep coming back), it’s probably better to choose a few of the best photos and leave the rest off the page. I really can’t tell you how annoying this is. There have been food blogs with no “print” button that have so many photos that when I make the mistake of printing the page, they print out 20-30 pages. This really makes for a very unenjoyable experience. UGH, Sorry about the quinoa. I will make a not now. Thanks for the heads up. SO happy you guys loved this though. Thanks!! Oh man! This is delicious! I saw this recipe on Buzzfeed and decided I would make it for quick and easy work lunches. I ‘m so glad I did because it was absolutely fabulous! My boyfriend called it a “keeper” and we will definitely be making it again! So happy you loved this! Thanks Nicole! Found this on Buzzfeed and I’m so excited to try it! I love that it’s a bit healthier by using quinoa but it still retains all of the cheesy goodness. That melted cheese makes me drooling. Just tried last night, this recipe is delicious!!!!! I can’t get enough!! It’s so simple too! I added extra cheese to make it extra extra cheesy! Can quinoa taste any better!? Thank you so much, Cindy! So happy you loved these! Thanks so much, Jimmy! Have a great weekend! YEAH! So happy you loved this, THANKS! I tried this recipe and it turned out awesome! I posted it in my blog with a link in yours! eager to try other recipes! So delicious and quick! I added 1/2 lb mild italian sausage after the other posters’ suggestions so that my boyfriend would eat it. Turned out amazing, “epic” in his words. I did use fat free half and half to try to make up for some of the added calories from the sausage and it was fantastic (i’m sure with heavy cream it would have been absolutely incredible). This will be on the menu at my house often in the future! Thank you! Looking forward to summer so tried this tonight. It was so amazing!! I’ve already shared the recipe with several friends. I live alone and cook for myself and I think this is a great dish to make that will stretch for 3-4 dinners this week. Thanks! Outstanding. I, like Katy, cook for one and this dish made me 4 generous meals of delicious goodness. And so easy, with no special prep for the tomatoes. Thanks for a keeper of a recipe, one I am certain to make again. This was a great recipe!! I’ve eaten it twice and loved it. Even my husband loved it. Could it be made ahead & frozen? Yes, it can be frozen, that works great! I know this post is from forever ago but I’m making it this week! What did you broil the food in? My glass pyrex dish is a no-go for the broiler =( Thanks! The pictures caught my eye and I am definitely going to try this. As for the quinoa- are you to soak it or anything prior to adding to the mixture? Or just put it all together and let the gooey goodness go? Hi Robin, you do need to cook the quinoa before adding it in with anything else. Just follow the directions on the quinoa package. Hope you love this! I made this tonight, except it was more of a 2.0 version. I have tons of fresh garden veggies in my fridge and decided to toss in kale, spinach, zucchini, mushrooms, corn, red bell peppers, and cherry tomatoes. I also added chicken because, well I love chicken! It’s in the oven right now, I can’t wait to try a spoonful of this deliciousness. Can i substitute low-fat milk for the heavy cream? just trying to make this a bit more healthy. yes, i think that will be fine. Enjoy! Easy and delicious!I’m thankful for another way to eat quinoa than salad! Looks Yummy! Can’t wait to fix. This is delicious! I used this as my meal prep for the week. I will be eating it for lunch everyday! I used half the amount of mozzarella cheese, brown rice in place of the quinoa, and 2% milk in place of the cream. THANKS! Love your healthy swaps! Made this tonight for dinner. Holy Moses, this was ahhhhhhmazing!!! Thank you so much for sharing! I paired it with asparagus spears and it just looked so pretty and colorful. My husband and teenage daughter even liked it. This is a perfect vegetarian dish. I love this recipe. I also used 2% milk instead of the cream and it was delicious. One thing that will send this recipe over the roof is garlic. I sauteed 5 cloves of minced garlic in a very little bit of olive oil and then added the pasta sauce, cheese, milk (cream). My boyfriend thought he was eating a meat lasagna. This meal is simple, top notch, and a great use of quinoa. Thank you for posting it. Do you cook the quinoa first or will it just cook in the sauce? HI! Yes, cook the quinoa first. Let me know if you have other questions, thanks! I love this recipe and my husband likes it even though he is not fond of quinoa. I found it a bit salty and am trying to find a way to cut the sodium. I didn’t even put the salt from the recipe in it. Maybe will have to make my own sauce and leave out the sodium. Cutting cheese could help too. Very happy you enjoy this, sorry it seems salty to you. I think your best bet is to make your own sauce. Let me know if you have questions, thanks!! So if I am reading this correctly I don’t have to precook the Quinoa? It cooks in the sauce? (sorry Quinoa newb here). HI! No you do actually need to precook the quinoa first. The recipe is for cooked quinoa. Please let me know if you have questions, thank you! I didn’t see the part where it said 2 cups cooked quinoa in the recipe, so that answers my question. cooking now. Hi James ! Sounds like you figure it out? I hope so!! Let me know if you have any questions! This looks delish! What is the nutritional break down for this recipe? I’m counting calories! Thanks! Hey Mary, I am sorry, I do not know the the calories. Wish I could have helped more. thanks! 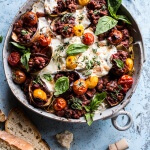 I would use buffalo mozzarella cheese and after it is baked I would drizzle it with a balsamic reduction–then it would truly be a caprese!! Totally missed the 2c “cooked” quinoa part!! Glad you found it! Let me know if you have any other questions! This dish is amazing! Thank you for sharing! This looks amazing. Do you think it would freeze and reheat okay? I’m looking for recipes to make and have on hand before baby arrives! This. Recipe. Is. Awesome!!! I would have eaten the entire pan by myself if I didn’t have to share it with my family! 😄 I trickled on a little balsamic vinegar before serving just because I like it on my Caprese salad, but was delicious without it! Thanks for the recipe, I pinned it, too! A yummy gluten free dish 🙂 that I must try. Yes! I hope you do try this Sandra! Thank you! Thank you for this recipe. I couldn’t stop eating it. So good! I am so glad you loved this Sheri! Thank you! 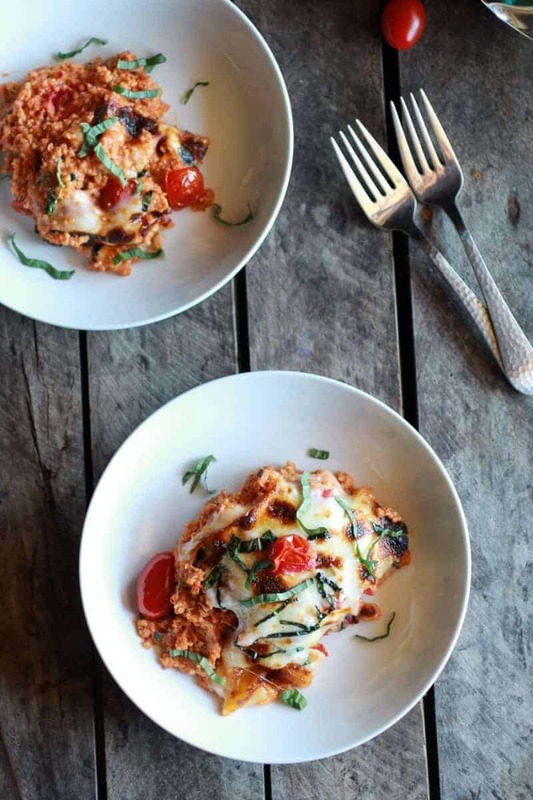 I have your cookbook and am wondering if you like this recipe or the Caprese Quinoa better? I absolutely love this recipe! It is my favorite “Go To” recipe in our house. My cousin is having a baby next month and I am hoping to make this recipe but freeze it for her to have a ready made meal to make life a little easier after baby. Any suggestions on what temp and for how long to heat if I freeze a head of time? Loved this! So flavorful and cheesy! Oh my goodness… this was so stinking good! I will be making this many many many more times… The flavors were so on! So simple and yummy and amazing!